As many tribal and ethnic interest groups jostle for positions in President Kufuor's second term of "Positive Change Chapter Two" mandate, the Eastern Region has emerged the dominant force in Kufuor's cabinet with five Cabinet portfolios. The five are Osafo Maafo, Minister for Education and Sports, Hackman Owusu Agyamang, Minister for Works and Housing, Nana Addo Dankwa Akufo Addo, Minister for Foreign Affairs, Felix Owusu Agyepong, Majority Leader and Minister for Parliamentary Affairs and Dan Botwe, Minister designate for Information. President Kufuor's home region, the Ashanti Region and the Greater Accra Region both placing second with three cabinet ministers each. The three Cabinet portfolios for the Ashanti region are Kwadwo Baa-Wiredu, minister for Finance and Economic Planning, Dr. Kwame Addo Kufuor, Minister for Defense and Alan Kyeremateng, Minister for Trade and Industry. One Political analyst who declined identity said "If we were to count president Kufuor himself as a representative of the Ashanti Region, the region would have rubbed shoulders with Eastern as near equal contenders in cabinet. The two regions, Eastern and Ashanti, are acclaimed faithfuls of the New Patriotic Party (NPP), with Eastern Region being faithfully described as the 'World Bank' of the NPP, to match the NDC's stronghold of the Volta Region. And as if to fulfill the old adage of the elephant that "it will dig for its child to drink so that in future, the child will also dig for it also to drink," the NPP government led by president Kufuor is rewarding the two regions for their unshakable loyalty. The Greater Accra Region matches the Ashanti Region with Ayikoi Otoo as Attorney General and Minister for Justice, Professor Mike Ocquaye as Energy Minister and Jake Obetsebi Lamptey as minister for Tourism and Modernization of the Capital City. The Northern and Western Regions, also share the third position with two Cabinet portfolios each. The Brong Ahafo, Central, Upper East and Volta Regions, each got only one Cabinet portfolio, with the Upper West Region managing an uncomfortable place of fifth position with no cabinet minister. With particular reference to the Upper West Region, it may be said this time around, that President Kufuor is continuing his avowed policy of "zero tolerance," though not for corruption, but the zero support he got from the region. The NPP did win only one parliamentary seat in the region in the 2004 elections. Or it could still be that, to quote president Kufuor's own words, "he has not yet found any person suitable from the Upper West region to work with." As to why the Upper West Region's cry for attention yields no fruits and seemed to have fallen on president Kufuor's 'deaf ear' and especially since the constitution mandates a regional balance, it is only President Kufuor who can tell. As it stands now, Public Agenda can only speculate. 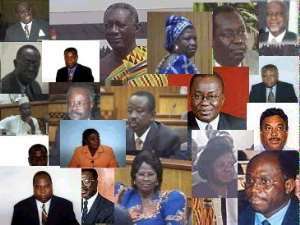 The Upper East Region's success at a Cabinet portfolio is said to be heartening to many Upper Easterners. Major Courage Quarshigah's loyalty to the NPP and especially to President Kufuor paid off as he moves to the Health Ministry from the Ministry of Agriculture, and remains again the only Cabinet portfolio for the Volta Region. Little known Charles Bintim, former Deputy Northern Regional Minister and now Minister designate for Local Government and Rural Development, joins Hajia Alima Mahama, MP for Nalerigu, Dr. Edward Mahama's home constituency, and Minister designate for Women's and Children's Affairs, as the Northern region's share of the 19 Cabinet portfolios. The Central Region also grabbed one cabinet position, with Prof. Dominic Fobih, as Minister for Lands, Forestry and Mines. Many commentators are of the opinion that since the Central Region 'betrayed' their own kinsman, Professor John Evans Atta-Mills, the flag bearer of the National Democratic Congress (NDC it deserves better than just one cabinet portfolio.